It’s time we reflect on the militarisation of our education, of our society as a whole, to confront our complicity and our responsibilities, stand up, and put an end to the business of war. 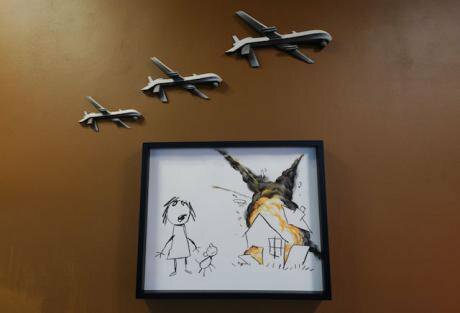 Detail from installation by artist Banksy, entitled Civilian Drone Strike, on display at the Arms Fair art exhibition set up in opposition to the Defence Security Equipment International 2017 (DSEI) - at Capstan House in east London. Yui Mok/Press Association. All rights reserved. This September, “one of the world’s largest arms fair”, DSEi (Defence & Security Equipment International) took place in the ExCel Centre in London. States with horrific records of human right abuses, violation of international law and support for ethnic cleansing and genocide were invited to “shop” for the latest weapons. For many years now, activists have protested this biennial DSEi arms fair. This year, as part of Stop the Arms Fair, a rare coalition of campaigners, academics, faith groups, poets, musicians, artists and supporters came together using creative and educational means to protest the literal showcasing and selling of arms. This productive, collaborative protest adopted a different campaign focus on different days of the fair; each time shedding light on a key issue such as the sale of arms to Israel or the sale of arms and technology for use against migrants. 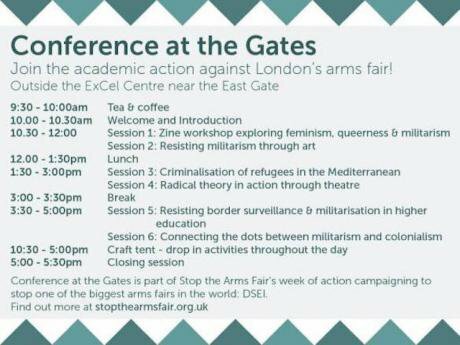 On Friday, September 8, academics, students and activists came together to hold ‘Conference at the Gates: Academics against the Arms Trade’. Workshops and activities were held around topics such as ‘The Criminalisation of Refugees in the Mediterranean’, ‘Popular Culture and Militarism’, ‘Feminism and Queer theory’, and ‘Radical Theory in Action through Theatre’. As part of this conference, Demilitarise King’s held a joint workshop alongside Unis Resist Border Controls titled ‘Recognising and Resisting Border Surveillance and Militarisation within British Higher Education’. I want to outline the campaign, our aims and why we’re passionate about demilitarising higher education. Demilitarise King’s is a student-led campaign that was inspired by the work of both the Fossil Free divestment campaign and the BDS campaign within the Palestine solidarity movement. It differs in scope, however. When setting up the campaign, we wanted to target all states and companies committing human right abuses, and we wanted our university community to do more than divest from arms companies. Demilitarisation would require reflecting on all aspects of militarisation within and beyond the walls of our university. From our various experiences as students, activists, university community members and supporters at KCL, we came to discover that our university’s complicity in the business of murder was not limited to its investments in arms companies like BAE Systems, Elbit Systems, and General Electric. Connections to the arms trade extended way beyond the millions of pounds in investments, to sectors like research, fundraising and procurement. We learnt that some university staff members are being paid wages by companies like BAE Systems; and that one department was currently seeking funding from the Saudi defence ministry. Even in the day to day running of our university, it is clear how deeply enthralled, invested and dependant we are on the tradesmen of war. A great number of our printers and electronics at university are supplied by HP, an arms company supplying technology such as biometrics and ID cards, in an expanding settler-colonial project whilst upholding a state of apartheid. We know, from meetings with senior staff, that King’s has already recognised and organised its investments in arms. This was no shameful secret about how much is being spent and on what type of arms – we quickly found out for example, that King’s is investing in specific types of firearms, something we were unaware of. Then there were the investments of staff pension funds, particularly USS, in landmines and cluster munitions. Not to mention millions of pounds connecting our very university’s Defence Department and Serco; a company known for running detention centres such as Yarl’s Wood, where countless assaults against migrants have taken place; where treatment of migrants, as one woman put it, was like that of animals. Demilitarise King’s has tackled militarisation in recruitment and careers, not only at university fairs, and in college spaces, but in our student union spaces too. Why is it for example, that at every freshers’ fair, the Army Corps and defence sector are the first stalls you see upon entering? Militarisation is extended to union society events, where military speakers who have been known to boast about the number of Arabs they have killed, or refer to Palestinians as “ratbags” and Arabs as “the biggest failure in the history of the human race”, were invited and welcomed under the banner of free speech. That free speech is not however, available to all, with students being “randomly” selected to enter some events, and with support from the Principal himself, who in one case, suggested informing students that ‘looked’ to have pro-Palestinian views, that they weren’t allowed to ask questions; in one stroke undermining any argument for free speech, encouraging racial profiling and allowing militarised voices to go unquestioned. Then there are the subtler ways in which our university links to the arms fair, for example the connection between the Church of England and the university, and the Church House’s role in hosting arms fairs. When In 2016, I asked at an open meeting why it was that KCL was investing in arms companies, one response was: because “the most moral institution in the world”, the Church of England had connections with arms companies, therefore it was OK for us as a university to have these connections too. I raised this issue again in a meeting with senior staff, only to be told to remember that KCL’s connection with the Church was not to be questioned. What if we were to tweak the case so that it was another place of worship, like a mosque or a synagogue or a religious organisation, for example the Muslim Council of Britain hosting arms fairs selling weapons to places like Saudi Arabia, how justifiably outraged would everyone be? Beyond the financial investment, recruitment and connections, crucial to our campaign is the focus on militarisation in discourse around campus and within our curriculums. As a student in the War Studies Department, I’ve seen countless examples of this. One lecturer of mine (an ex-IDF general) encouraged our class not to call Palestinians Arabs, but to refer to them as “the non-Jewish community” – a direct erasure of identity. A highly esteemed guest lecturer who had served in the private sector in Iraq, Afghanistan and Somalia, when asked why he’d personally been invested in working in these three countries, shrugged and stated it was for the money. The issue around these cases from problematic lectures to the curriculum and reading lists, is that most of the time these militaristic voices are amplified, glorified and put on a pedestal. Opposing opinions can be found at the bottom of additional readings, if they can be found at all; and if voiced in class, they are far too often ridiculed and silenced. The issue with a militarised voice is not its existence, but its dominance. More frustrating than King’s’ militarisation of our education is the hypocrisy it hides behind, something that unfortunately isn’t unique to KCL. Whilst having connections with Serco, KCL boasts about two “sanctuary scholarships” it has provided for refugees, though they seem to simply have taken the place of “conflict zone scholarships” that students fought for years ago. The 2029 Strategic Vision that King’s has outlined is apparently about “making the world a better place”, but how can this be the case when King’s is also investing millions in companies that sell weapons to states like Saudi Arabia, Bahrain and Israel? As our campaign group wrote in our open letter: "If the purpose and values of King's College are to educate and promote skills and research to make the world a better place, why does our institution continue to invest millions of pounds in the companies which make the greatest contribution to the displacement, murder and destruction of human lives? If King's College is to represent itself as providing answers to 'world questions', we must work to actually address the systemic causes of global suffering and examine our own complicity in these practices." We are sick and tired as people of colour in particular, of being used as tokens for publicity and education-consumerism, with no respect for the very values these institutions claim to embody. A painting of Nelson Mandela hangs in the Principal’s office wall; the Archbishop Desmond Tutu’s name is used for university rooms, his picture on the side of the Strand Campus. Other universities like Newcastle, Sheffield and Manchester boast about men like Martin Luther King and Malcolm X/ el-Hajj Malik el-Shabazz debating at their universities or speaking at graduation ceremonies. Why are these names and faces used to sell education at these institutions while the principles that they stood for continue to go ignored? Did the University of Newcastle forget that MLK in his speech, called the ills of society “war, poverty, and racism”, as they continue to fuel all three ills with their investments? And did King’s forget that Mandela claimed that the freedom of South Africans would not be achieved without the freedom of the Palestinians? Or the comparison that their beloved alumni Desmond Tutu made between the apartheid that black South Africans faced and that which the Palestinians face today, while they support the technology and arms supplied to this very same apartheid state? Within the four months or so since we started our campaign, we’ve achieved a lot. We’ve raised awareness, we’ve staged a die-in at the 2029 vision launch party, we’ve questioned the principal on the spot, we’ve voiced student opinions on the Socially Responsible Review Committee. Most of our success came out of collective efforts from political campaigning societies such as the People of Colour Association, Action Palestine Society, Fossil Free campaign, Intersectional Feminist society, Student Action for Refugees society, under the banner of a KCL Anti-Racism Campaigning network. This was crucial because the militarisation of our university is a concern for all of the political campaigning groups within the Anti-Racism block. Working as a collective meant that we were much stronger, our message could be more wide-reaching, more people were involved, and that our approach was creative, united and multifaceted. Also very important was the fact that we took into consideration different approaches, and elements. For example, the effect that militarisation has specifically on people of colour was something we considered, not only in our main campaign aims, but also in the way we campaigned – for instance the role that white allies could take on in direct actions. Militarisation needs to be recognised and resisted in whatever spaces we occupy in our daily lives. A call for demilitarisation goes hand in hand with calls for greater transparency and democracy in allegedly progressive spaces like universities. After all, I never remember signing up or ticking boxes stating that I agree for the university to spend my tuition fee on killing innocent people across the world, fuelling war and apartheid, supporting human right abuses and violating international law? Where was that in the terms & conditions? Where was that in the "what King's offers" section? During the Stop the Arms Fair, over 100 people were arrested, some for obstructing roads, ironically because they were apparently “endangering the safety of civilians”. Whose safety have these protesters risked? Whose lives were the police ‘protecting’? And to return to DSEi, it’s time to question whose defence and whose security DSEi is concerned about? This week, court cases will be held for those arrested, and we have the opportunity to turn up and show our support. Be warned, DSEI has already started planning for the next arms fair in 2019 – the business of killing is one that never ends; a world where dead bodies count as profit is one where ‘profits’ can always be reaped. There is not even the shame of pretending that there is some concern surrounding the selling of these weapons between these unethical states, nor is there any active, or even passive, effort to stop war. It’s time we reflect on the militarisation of our education, of our society as a whole, to confront our complicity and our responsibilities, stand up, and put an end to the business of war. Conference programme 2017.